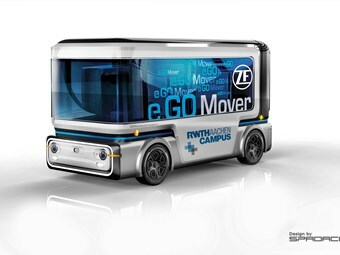 REDUCED OPERATING COSTS and a simultaneous increase in safety for all road users will enable ZF autonomous vehicle tech to prevail in passenger transport and freight logistics, the company reported recently, with its e.Go Mover project to be displayed at IAA 2018, this September 20-27. The eGO People Mover will showcase tech that should soon be on buses. ZF will be demonstrating its multiple systems expertise as a partner in the newly founded e.GO Moove GmbH joint venture, in addition to other innovations, the company states. The e.GO Mover is part of an entire digital logistics offering including hardware, software and services, highlighting the company’s strategic orientation. ZF's CEO Wolf-Henning Scheider and Dr. Günther Schuh, founder and CEO of e.GO Mobile AG based in Aachen, Germany, have announced that series production will begin there in 2019. The e.Go Moove GmbH joint venture partners manufacturing people and cargo movers primarily for the urban mobility needs of the future. Five-digit volumes are initially scheduled for annual production and ZF is expecting that the demand for these vehicles will reach approximately one million in the next five to seven years, it’s claimed. The company is equipping the e.Go Mover with electric drive systems, steering systems and brakes, as well as ZF’s ProAI central computer (using artificial intelligence) and sensors, which enable automated driving functions. "System providers like ZF can significantly benefit from the worldwide trend toward automated driving and electromobility," said ZF CEO Wolf-Henning Scheider during the ZF Technology Day 2018 in Friedrichshafen in July. "The e.GO Mover is the first production-ready vehicle featuring ZF systems, which provides an autonomous mobility concept for cities." ZF is presenting further examples for digitally connected technologies using an autonomous, electrically-powered delivery vehicle for package delivery services. With this, the courier neither has to drive nor park - the vehicle can follow them independently from one delivery point to the next with zero emissions. At the IAA Commercial Vehicles show in September this year, ZF will show further use cases for its ZF ProAI supercomputer and broad set of related sensor systems, which can help to increase efficiency and save costs throughout the entire logistics chain. ZF's CEO Wolf-Henning Scheider clearly sees the benefits for commercial vehicles when it comes to introducing autonomous systems, it’s stated. "Initially, we expect to see automated driving activities more commonplace on company premises and logistics depots, in harbors, or in agricultural environments as operations there tend to be more recurrent and the surroundings are not too complex." [However] the technology is also expected to prevail in freight logistics and passenger transport because it can reduce operating costs and at the same time help to increase safety for all road users, ZF says. As a supplier for buses, passenger cars, trucks, light commercial vehicles, agricultural applications and construction machinery, ZF is in the optimal position to create synergies between these areas, it’s claimed. "In an increasingly complex technology environment, companies that can quickly offer harmonised subsystems or complete system solutions have a distinct advantage. This is how we have aligned our company’s strategy," said ZF’s CEO Scheider. "ZF’s strategic focus is to be a systems provider that shapes ‘Next Generation Mobility’. We want to provide systems solutions which can address all potential requirements when it comes to the mobility of the future," he said. With its broad portfolio of products and competencies, ZF is already active in the relevant technology fields, it says. By mastering the integration of sensors, control units and vehicle motion control, ZF has gained a strong market position, it adds. The company is focusing on four fields: automated driving, electric drives, integrated safety systems and vehicle motion control – to make the driving experience as comfortable and pleasant as possible for occupants. In addition, ZF has set up its Internet of Things (IoT) Cloud-based system in order to enable extensive networking between systems. ZF is a global leader in driveline and chassis technology, as well as active and passive safety technology. The company has a global workforce of 146,000 with approximately 230 locations in some 40 countries. In 2017, ZF achieved sales of €36.4 billion and, as such, is one of the largest automotive suppliers worldwide, it states.